The Raritan Express Shuttle is a new rail service that is in the process of being developed by the Raritan Central Railway, the State of New Jersey, and other transportation entities that serve the waterfront area in Northern New Jersey. 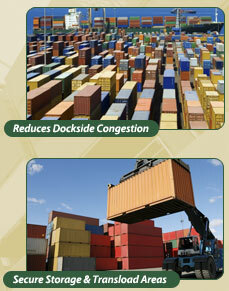 Much like the Alameda Corridor in Los Angeles, CA, the Raritan Express will help to reduce dockside congestion by rapidly moving containers and goods from dockside areas to an “inland port” type of operation, allowing for better utilization of the existing port infrastructure. There, all of the operations will occur in the type of highly safe and controlled environment needed in today’s new global economy. The terminal for the new shuttle will be the Raritan Logistics Center in Edison. The main component of the logistics center is the 2,350-acre Raritan Center Business Park. Additional space and services will be available at Heller Industrial Park, also located in Edison and served by Raritan Central. The logistics center will be able to provide a complete range of 3PL services including customized transloading/warehousing/distribution/packaging, short sea-shipping connections, and the ability to transfer from container to railcar. Available buildings, build-to-suit space, and grounding areas will allow shippers the ability to expand to meet their unique needs.